Considering the amount of time all of us spend inside cars, it is essential to clean your car interior as you do to your houses. While many of us take out time on Fridays to give our cars a wash in the garage, a proper cleansing is well beyond that. Today, we are going to talk about some important measures you can take to get a cabin that is spotlessly clean and free of germs. Here is the step-by-step guide. Properly cleansing a car’s interior takes about an hour, so only go for it once you are sure you have that much time. Collect all equipments you’ll need and pile them neatly near the vehicle. Moreover, remove all sorts of belongings and garbage from the cabin, so you finally can get down to the job. Begin with vacuuming your car. First off, remove the floor mats and vacuum the carpet. This is the dirtiest area, so you should be spending more time flushing the dust out of it. Don’t forget vacuuming the trunk carpet as well. Once done with the carpets, move on to the seats and the dashboard. These are sensitive parts, so vacuuming can easily damage them. Make sure you attach a soft brush at the end of the hose to avoid scratches. With everything vacuumed, your car is now free of major dirt. Next in line, you should target all those coffee and grease stains on fabric seats and other upholstery. With several products available for this job in the Middle Eastern countries, stains are no more a problem. It is as simple as applying the cleaning product and wiping it off only to see the stains disappear. Additionally, a detergent can also do a decent job. Add a small amount of it to warm water, dip a clean cloth into it and shake off all excess water. Now rub this mildly wet cloth against the stain and it should be gone with a few strokes. You can also carry the same process for carpet stains. 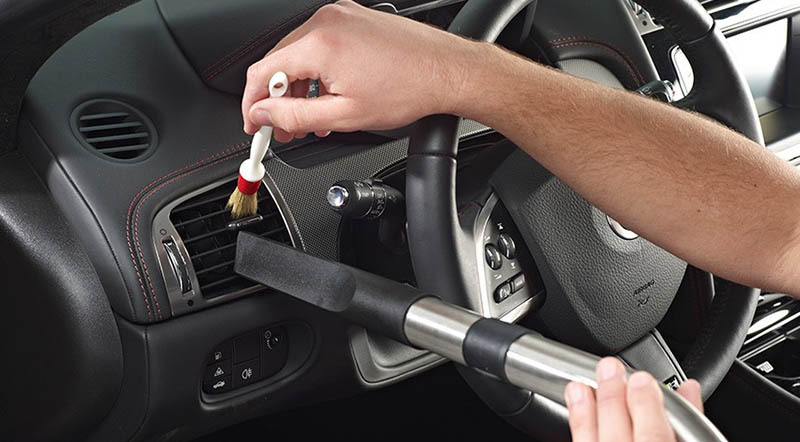 With dust particles removed through vacuuming, you now need to adopt further measures to actually make the seats and other leather equipment spotless and germ-free. This will largely require leather care products. Typically, you would be required to pour some liquid onto a clean cloth and then rub it against leather surfaces. This is one of the best methods to clean leather. You can also use a toothbrush to reach crevices, where a cloth often cannot reach. One disadvantage of these products is that they leave the leather sticky, especially if you wipe over the leather-encased steering wheel, which makes your grip slippery. I suggest you first use a small quantity on a particular area and witness the result before applying it elsewhere. The dashboard takes a whole lot of space right in the front and it definitely should look neat. Thus, you need to keep it clean and shiny. People usually rub plain clothe against it, but that barely removes dust. A better option is to use plastic cleaning products (or a leather product, if your car has a leather dashboard). Carefully pour the product on a 100% cotton towel and wipe the plastics with it. Remember, not to spray the product directly on the dashboard as it will damage the electrical equipment. The cleaning product will revive your dashboard and carrying the procedure each week will make it look new. Lastly, using a glass cleaning product wipe your windows off any stains and dust. Spray some deodorant into the cabin and you’re set to go for a clean hygienic ride!